How has the vessel operation card fared over its first year? There is still work to be done, but stats show it’s catching on for boaters. SACRAMENTO—California’s Boater Card, a little more than one year after its roll out, is starting to make its way onto vessels. By 2025, all adults will be expected to carry one while operating a boat. There are still some matters, however, to work out on a card seemingly created to legally mandate boaters to take a safety course before they get behind the wheel of the boat. Similar to a written driver’s test, the card validates a vessel operator’s knowledge of the water – at least from an information standpoint. As the boater card has been legally required for some age groups for a year, how have boaters taken to this new policy? Here’s a little more about the card, what it does and doesn’t do and how all adults will eventually be required to carry one on them whenever they’re navigating California’s waters. The California Boater Card received its year in review presentation by Evan Becker, a program analyst with the Division of Boating and Waterways (DBW), after its first year in existence. Becker’s presentation, which was made at the Feb. 7 DBW meeting, concluded the new boater education mandate was so far, so good. He reported favorable information about the first year, adding some boaters were happy to show off their new vessel operation cards at events like the Fred Hall Show. In 2018, Becker said there were 23,000 applicants and 19,000 cards were issued. DBW’s official website was visited 250,000 times, according to Becker. He added the website had to be updated since a much larger percentage of visitors were accessing it from a mobile device – the updates were to accommodate mobile users to make their experience more appealing. As one might predict, the peak applications were between May and July (the height of boating season) and the least amount of applications received were during winter months. Though there are many in-person courses provided on boating safety (The Log’s boating classes section promotes in-person courses in every issue), 71 percent of boaters took an online course to qualify for the Boater Card. Home study was the next most popular way with 21 percent of students choosing that option. Classroom and on-the-water courses were only a small sliver of the pie at 8 percent. The most popular course was Boat U.S.’s free offering, followed by Boat Ed and DBW. It was also found residents in all but nine states had applied for the card. Becker also stated a public hearing was being held for feedback on the Boater Card later the same day of the DBW meeting. The Log reached out to DBW to gather information about what took place, but an update was not given by press time. Any further information provided by DBW’s staff will be updated online or in a future article. How did the California Boater Card come into existence? On Sept. 18, 2014 Gov. Jerry Brown signed Senate Bill 941 (SB 941) into law, which prohibits the navigation of a boat without a DBW issued boater card. Language of the bill also states that the required amount to fund the program should not exceed $4 million and required that the division would need to develop the vessel operation cards by Jan. 1, 2018. In order to bring boaters up to date gradually, in the first year boaters ages 16 to 20 were required to hold the card while steering a vessel; failure to meet the requirements would result in a fine. Another requirement by the bill was that DBW would have to give the first review of the card by April 1, 2019, which was met with the presentation by Becker. From then on, DBW will need to give an annual update to share information. The division will have to post on its official website “specified recommendations relating to the program” for two other dates thereafter – April 1, 2023 and April 1, 2028. What purpose does the card serve and how will it evolve? As one of the nation’s favorite pastimes, recreational boating safety has always been a priority. In DBW’s 2016 California Recreational Boating Accident Statistics, it was reported the majority of accidents were due to operator error, with 32 percent of accidents happening from “operator inattention” and 25 percent from “operator inexperience.” Excessive speed was cited at 15 percent. By mandating that boaters, especially new boaters, must take a safety course before getting on the water, it’s clear DBW’s main goal is to ensure boaters are receiving proper safety education. Will this prevent all the accidents on the water? Probably not. However it is possible to correct some behaviors or misconceptions about boating that do lead to accidents and could make some more aware if the alternative is being fined. During the meeting, Becker stated the most popular way for boaters to earn their card is to take the free online test provided by Boat U.S. This begs the question of whether the license is really that similar to an automobile license since there is no hands-on practical boating operation test that must be passed to certain standards in person. At this point, all the card does is show government-issued proof that boaters understand basic safety and navigational procedures while operating a vessel. Some courses had been grandfathered in so adults older than 20 during the first year of the California Boater Card could apply with a recent course. However, this year any course or certificate program taken before 2018 will no longer meet requirements to qualify for the California Boater Card. The card at its current cost is $10 and lasts a lifetime, meaning no other courses will be necessary in the future. 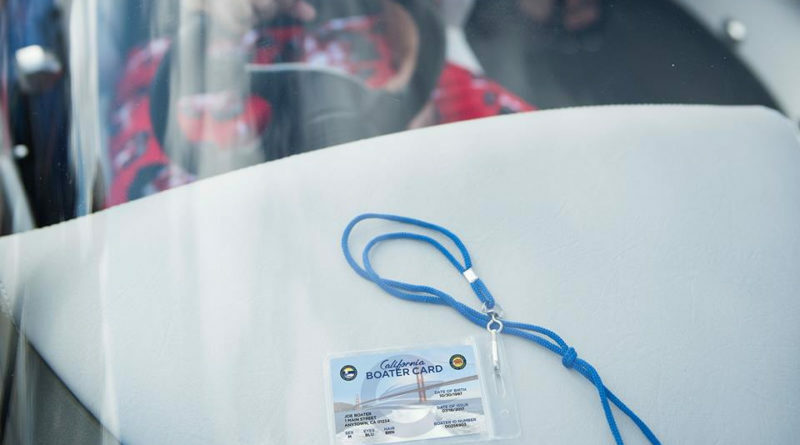 For those who are curious about applying for the California Boater Card or would like to learn more about the process, visit the official website at californiaboatercard.com.